Its wearers couldn't go five minutes without being touched. Hearing that women are frequently sexually harassed — or reviewing the data — isn’t enough for some people. 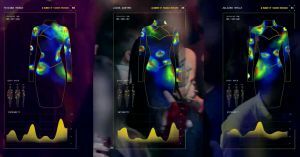 In an attempt to force skeptics to acknowledge the pervasiveness of sexual harassment, Swiss beverage company Schweppes and Brazilian ad agency Ogilvy teamed up on the “Dress for Respect,” a sensor-equipped smart dress that tracks every time someone touches the wearer — which, for the women who tested the dress in a Brazilian nightclub, happened way too much. According to the video Ogilvy produced for the campaign, which it released earlier in 2018 but is just surfacing in the English-language media, sensors built into the dress track each touch, and then relay it via WiFi to a control unit. When a man touches a women wearing the smart dress on her upper arm, for instance, the same area lights up on the dress on the control unit’s computer screen. It even notes the intensity of the touch, as the sensors record not just the presence of a touch, but its pressure as well. Over the course of fewer than four hours in the Brazilian nightclub, men grabbed, groped, and stroked the three women wearing the smart dress a total of 157 times — which works out to more than one touch per woman every five minutes. This isn’t the first or only example of people using tech to shine a spotlight on harassment. Victims of workplace harassment can use the AI-powered Talk to Spot app to document their experiences. Those harassed on the street can share their story via the Hollaback! platform. And, of course, it’s hard to talk about sexual harassment without noting the impact of social media and the #MeToo movement. These victims might never have had the opportunity to share their stories so widely prior to the emergence of this tech, so it’s a step in the right direction that they now have these outlets. Still, if we want to stop harassment from happening in the future, we need to convince everyone that it’s happening now. And anyone who refuses to acknowledge the pervasiveness of the problem needs to watch the “Dress for Respect” video. New App Turns Consent Into A Contract. Why Do We Need It?